As a pet blogger, my focus in sharing my Pixel 'Tails of Adventure' is to bring joy, laughter, and occasional bits of doggie life in site as only a dog can do. It is also my goal to spread smiles throughout the Internet world. I have been blogging for about 3 years now, so it is just a part of who I am now. I have made wonderful friends with fellow dogs and cats blogging like I do. I have made lots of great connections with people and organizations all sharing a common bond of love for animals and human kind. Well, I was completely surprised the other day by my friend and fellow pet blogger, Basset Momma, who awarded me with the 'Pawsome' Blog award, which is awarded to blogs that bring love, laughter and 'furriendship'. She has such a wonderful blog that always makes me smile. I do try to bring love, laughter and friendship in all I do, every day, so to be recognized for it was such an honor. So this weekend, I had the difficult task of choosing only 8 blogs, when I have so many wonderful blogging friends out there. I chose to highlight blogs that I (of course) really enjoy, but also blogs that are very new, could use more followers, and have not won this award before. At least, I did my best to do so. 1. 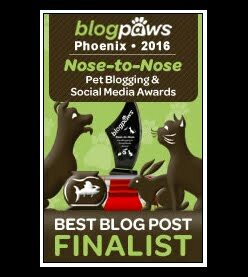 It is awarded to a blog that brings love, laughter and 'furriendship' to others. 2. Each recipient, if possible, must then pass the award on to 8 other blogs that bring the same joy to its readers. 3. The recipient of the award must display the award icon somewhere on their blog. What a joyful and wonderful way to share the love! Here are the 8 blogs I chose, and a little about each of the blogs to whom I am passing this award. The Chronicles of Mister Marmee is a very unique blog, whose author is from an unlikely background. 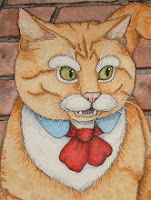 Mister Marmee is a consulting detective cat from Victorian London, who has been given the rare ability to access our century to share his many adventures and memoirs as part of a crime solving duo that includes Sir Happy Heart, perhaps the greatest detective the world has ever known. His words are brilliantly spoken, and you can almost hear his accent as he tells his tales. Having been a rescue cat himself, Mister Marmee truly understands the plight of his fellow creature. I encourage you to visit his blog often, and stay tuned, he is currently finishing up work on his memoirs. Four Mini Schnauzers and a Maltese Boy is an charming blog with some of the sweetest photos of a mini schnauzer named Christmas and her family of pups. They share their experiences with their human Mommy as she bakes homemade doggie treats and lets them help every step of the way. These pups are amazingly cute, with some of the brightest smiles around. They do a great job of bringing lots of smiles and happiness to each post, plus their Mommy shares details on all the wonderful treats she prepares with love for her five 'kids'. 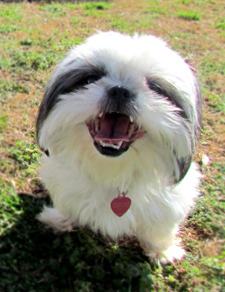 Gracie Lu Shih Tzu celebrates the joy of being an adorable Shih Tzu who loves all creatures great and small. She not only blogs about her own happy life with her Mommy who adores her, but Gracie Lu also shares stories and photos of sweet creatures from all corners of her world. She has a great sense of humor and enjoys telling all kinds of stories of her life. Her posts always make me laugh and smile, no matter her subject. 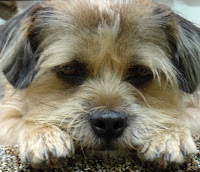 She is also an avid Twitter anipal, so check her out there as well...@GracieLuShihTzu. Mitzi Jo was one of the first blogging friends I met. She has a sweet heart and face, and is actually a bit of a celebrity blogger. She and her Momma run a doggie daycare and Mitzi Jo, MJ for short, shares her adventures there, as well as her adventures on the celebrity scene. She is completing a book due out soon, she has been in local movie productions and has even been in a commercial with Cesar Milan,the Dog Whisperer, for his new show on National Geographic Television. Check it out here: Cesar Milan National Geo Commercial. Peanut Pumpkin Pie is a truly delightful, fun blog with loads of personality plus. 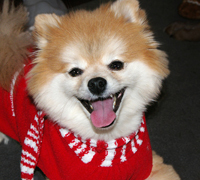 Peanut is a down to earth Pomeranian Princess, sharing her adventures in life. She even shares her ideas and views on what she calls 'Peanut Economics'. You will always get a kick out of her photos and views on the world around her. Peanut has an infectious smile that will light up your day, so definitely check her out. 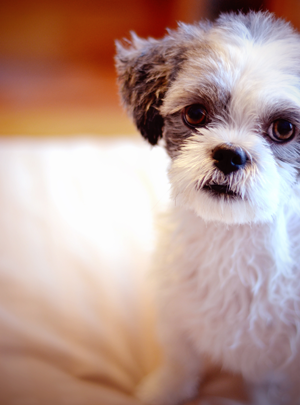 Sadie Shih Tzu is a flufftastic doggie blogger who lives in Canada with her British person. She has one of the best sayings I have ever heard..."Face licking is like meditation, but it tastes better!" 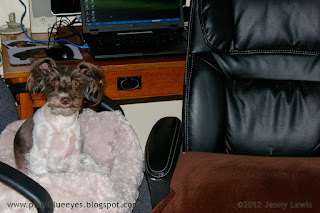 She has been blogging her many adventures since she was a mere puppy and she loves introducing new blogs to her followers. She is also on Twitter, and has quite a following, including the one and only Ellen Degeneres. You can view her twitter page and follow her at @sadieshihtzu. Salvatore's Boarding House is a non-profit organization that is building, from the ground up, a dream home 'haven' for homeless animals of all kinds. They are building a cage free, no kill animal sanctuary in a home environment that will shelter animals from all across the U.S. until they find their forever loving home. Salvatore's Boarding House is raising awareness and funds to assist in their noble cause. Their enthusiasm and love of all animals is catching, and I encourage you to support Salvatore's Boarding House in any way you can. 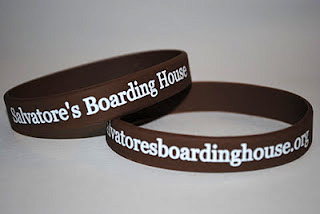 You can follow them on Twitter at @S_BoardingHouse. Susie-Bell is a very special dog with a very special story that she and her parents share on her blog called 'Susie-Bell the Foodie Schnauzer'. Her loving family rescued her from a puppy mill farm in the UK, where she was forced to breed puppies over and over in a horrible environment. She was nursed hack to health, and now they spend their days together, sharing the joy of life, unconditional love and amazing food. Her family hand prepares her home cooked meals and shares their amazing recipes, as well as Susie-Bell's daily life, in her blog. It is a heart warming journey that I know you will be so glad you could share. CONGRATULATIONS TO ALL THESE FANTASTIC BLOGS! Now, please go visit and even follow each blog, leave a comment of encouragement & congratulations, and share the love. 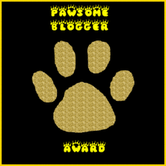 Thank you again, Basset Momma, for this very kind and gracious "Pawsome Blogger" award. This is also part of a Monday Mischief Blog Hop, so go visit the other blogs listed below this post and see what they were up to this weekend as well! 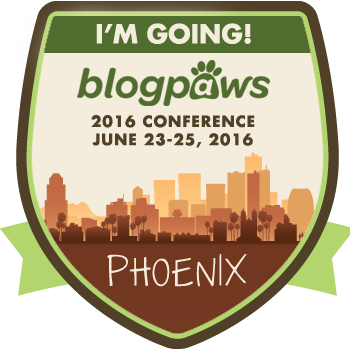 This Blog Hop is brought to you by Alfie's Blog, Snoopy's Dog Blog, My Brown Newfies, and Luna, A Dog's Life. Congratulations on your first blogging award! I visited the ones I haven't gone to yet. Your human is lucky to have ended up with a doggy who's always smiling. Take for instance the picture on top, you look like you're happy while sitting on that comfy pad. Hi Haopee! Mommy does feel lucky to have me, at least she tells me all the time! It's no wonder I love smiling! You are always so sweet to me, thank you for your compliments my friend. By the way, Mommy was sitting in that other chair in the photo, then she got up to take my picture...so I paused from writing to smile for the camera, haha! We hopped over from the Monday Mischief Blog Hop to say "Hi". Congrats on your award. Hi there Brown Dawgs!! What a pleasure it is to meet you. I am so glad you stopped by to say hi, thank you! Mommy and I will definitely be catching up on everyone's Monday Mischief. We have not yet been able to visit everyone...can't wait! Hi Pixel, congratulations!!! You have a great blog. I just started mine a few months ago and hope to someday be as great as you! I just want to spread my life and adventures to bring awareness to my rare breed. Great job and keep it up my furend! Congratulations it was well deserved! I will be checking out some of your blog picks I haven't seen before. Hi Basset Momma! You are so sweet, thank you very much for bestowing on my little blog. I am sure you will enjoy the blogs I shared the award with. This was such fun...I just want to give more awards out now, BOL!! I thought of a few others that could use this encouragement too. Hi Daisy!! So nice to meet you too my new friend. Thank you for the congrats. I am honored to have received it. I will definitely be coming to visit your blog tonight or tomorrow. I am honored that you feel so highly of me. I would be proud to display my award from you. Momma Jean says she doesn't know how to get it to our site. ( we have a site manager who handles our blog. Momma Jean isn't good at that stuff) I love her anyway. Thanks again Pixel Blue and congrats on YOUR award too. Thank you so much Mitzi Jo, and you are very welcome! We will figure out how to get it to your site. Your site admin can just copy the image straight from my site. Or I can email it to you/them. We will figure it out, no worries. Just hopped by from Monday Mischief to catch up on your happenings and say hello! Have a great week! Hi there Hawk! Thank so much for stopping by on the Monday Mischief blog hop. I will definitely stop by soon to see what you were up to also! Now, where are you from? Mommy uses ya'll too, so I am guessing down south. Pixel, I am posting this for Jet as they're having trouble leaving a comment. CONGRATULATIONS! We're rather new to blogging (since Oct. 2011), so we've been learning about the awards scene. How fitting that you won your award on Oscar night. Mom told me to share that she really loves the pay it forward philosophy. We will make a point to check out your award winners, too. Hope you enjoy an award-winning day! I love your choices to pass on the award, such great blogs!! Hi Snoopy!! I am so glad you dropped by my friend. Thank you for the congratulation message. I am thrilled that you liked the choices...they are a great group. you are pawesome and deserving of that award! now off to check out some of these blogs out, i have not heard of a lot! Hi Pixel Momma...this is Kame and Kroten's mommy...thank you for visiting my girls. I will be doing the same with your blog. Thanks so much for stopping by. My next blog post due out this weekend, is all about my job as a Nurse Pixel. It should be pretty good. I hope you'll check it out. Take care my new friends!